in diesem Posting seht Ihr alle Boxerportraits, die ich bisher gemacht habe: Henry Maske, Max Schmeling, Wladimir Klitschko, Vitali Klitschko, Torsten May und Rüdiger May, alle im Format 2m x 2m. Ich wünsche Euch allen frohe Weihnachtsgage und ein glückliches und erfolgreiches Jahr 2012!!! 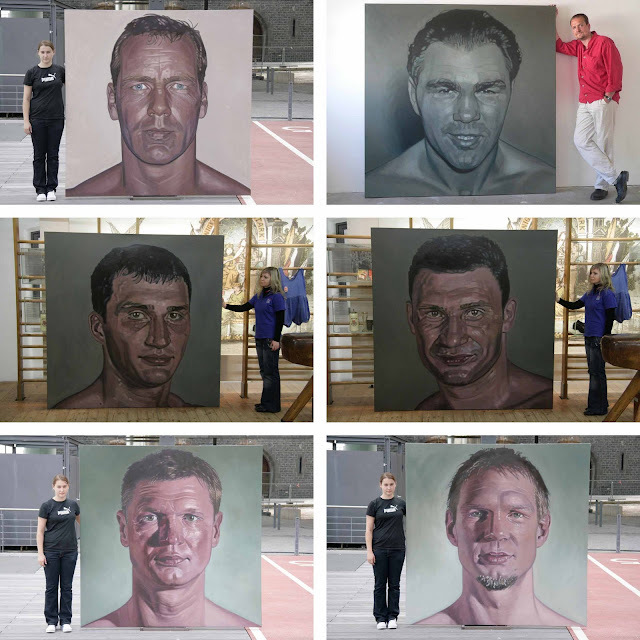 In this posting you can see all boxer portraits I´ve ever done: Henry Maske, Max Schmeling, Wladimir Klitschko, Vitali Klitschko, Torsten May and Rüdiger May, all in the size of 2 x 2 meters. Fantastic work! I'm very happy that you put people in the photos to show the true size and impact of these wonderful paintings. And I'm just taking a wild guess that the person in the upper right photo is you. Keep in touch and Have a Merry Lovely X-mas! Wow...It's amazing that you can get such good proportion in such large scale portraits. I can really see the resemblance in the two sets of brothers. What I love most is that they all have the face of a fighter: imperfect, proud, alive. And such a treat to see them all in one post. WOW that is fantastic! And Happy New Year! AMAZING PICS, GOOD JOB!YOU ARE VERY ARTISTIC! HAPPY NEW YEAR!!! cam to visit my blog and if you like we can follow each other (also on facebook!) keepintouchwithfashion.blogspot.com ...keep in touch! Holy Toledo!! Wow! Awesome body of work. NICE BLOG!! !I INVITE YOU T VISIT MY BLOG AND IF YOU LIKE IT TO FOLLOW ME FROM GOOGLE FRIENDS AND I WILL BE HAPPY TO FOLLOW YOU!! Fantastic portraits, congratulations for the great art!! !